Home > Shop By Brand > DeFelsko® Electronic Paint Thickness Gauges > Defelsko PosiTector 200 Series (Advanced) Includes Software! The Defelsko PosiTector 200 Series Paint Thickness Gauge non-destructively measures coating thickness on a wide variety of surfaces using proven ultrasound technology. This tool is perfect for measuring coating thickness over metal, plastic, and fiberglass auto parts. The Defelsko PosiTector 200 B3 Paint Gauge gives fast, accurate readings with no calibration needed. 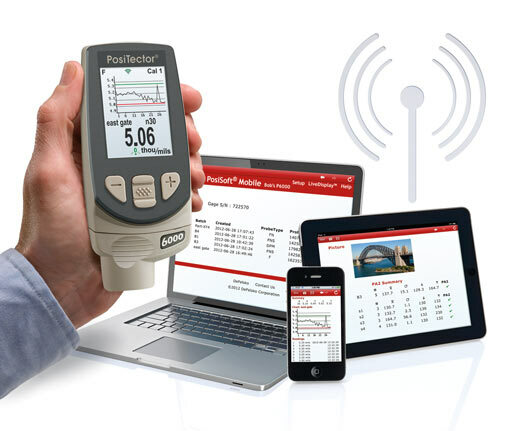 Defelkso's PosiTector 200 B3 Advanced is WiFi and Bluetooth compatible for maximum versatility! Auto dealers, car collectors, body shops, and detailers can all benefit from knowing the true condition of a vehicle’s paint. The Defelsko PosiTector 200 B3 Paint Thickness Gauge makes determining the amount of paint on a vehicle easier than ever. This easy-to-use device takes readings in seconds, clearly displays the information, and allows you to store and track your findings via downloadable software and a free online application. The advanced model features WiFi compatibility to sync with enabled devices. For maximum versatility, the Defelsko PosiTector 200 B3 Paint Thickness Gauge’s body accepts all Positector 6000, 200, DPM, UTG, RTR, and SPG probes. It runs on standard alkaline or rechargeable batteries and includes a built in charger for the latter option. The Defelsko PosiTector 200 B3 Paint Thickness Gauge features an easy-to-read, high-contrast, backlit display so you can easily read the results of your testing in any light. The display flips, so no matter what angle you hold the screen, you can view results right-side-up. The internal memory stores up to 100,000 readings in 1,000 batches, and the innovative hardware stores each reading with a time and date stamp to easily keep track. A convenient screen capture feature makes saving images onto a USB flash drive simple. The Defelsko 200 B3 Paint Gauge's proven non-destructive ultrasonic technique conforms to ASTM D6132 and ISO 2808 and SSPC PA9. Defelsko PosiTest DFT Combo Electronic Paint Thickness GaugeDefelsko PosiTector 200 Series (Standard) Includes Software!Defelsko PosiTector 6000 FNS1 Coating Thickness Gauge (with 3ft probe) Includes Software! Defelsko PosiTector 200 Series Advanced Includes Software!